Looking for a stylish way to feature graphics? 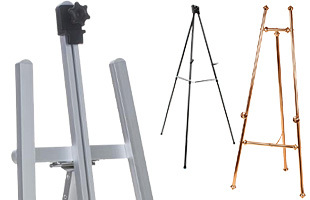 These display easels are excellent for making your menu, painting, event listing, advertisement or office presentation the center of attention. 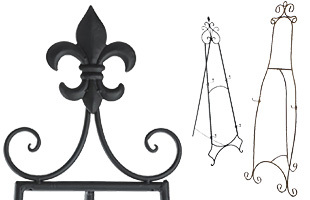 We stock hundreds of art stands with a versatile, yet simple design that puts the emphasis on what they're holding. In addition, our display easels for sale are offered in numerous styles for use with schools, businesses, art galleries and restaurants. Great for traveling, folding display easels have a portable design that makes them ideal for moving between rooms and buildings or going to present at trade shows. What makes our selection of presentation stands great for professional use? 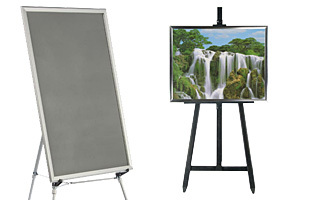 Our display easels for sale feature a number of placement options to accommodate any environment. Floor standing models benefit from being able to hold large, poster-sized prints like paintings, menus, workplace presentations and promotional graphics. 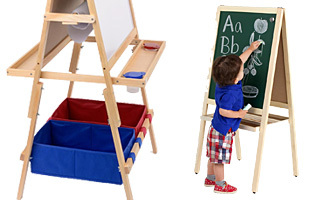 Tabletop easels feature smaller prints and are better when floor space is at a minimum. These are useful for event booths and store counters. 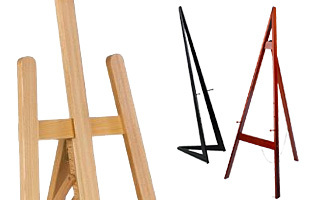 Our easels are offered in a wide range of materials to meet the needs of artists, teachers, marketers and store owners. For a classic appearance, choose a wooden model in a variety of finishes. This includes natural shades like beech and mahogany as well as neutral black. More modern materials such as aluminum, steel and acrylic give users are also available. These presentation tools come in silver, black and brass usually in a more lustrous satin or powder coat finish. 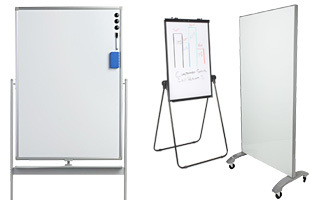 Classic whiteboards with wheels are also available for both classrooms and conference rooms. 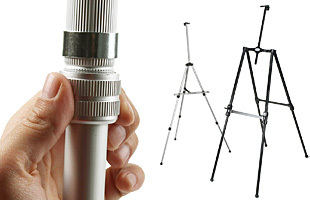 Different from tripod art mounts, these have a double sided design with a rotating writing surface. 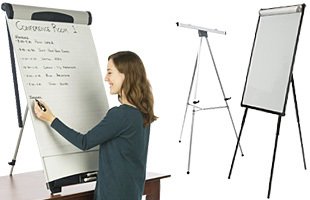 In addition, flip chart stands are ideal for educating students and presenting to co-workers with write-on media. 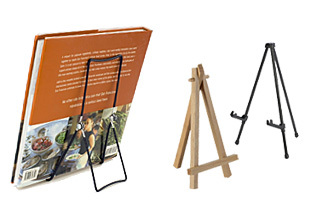 Poster holders like these specialize in having a lightweight and portable frame. All tripods have a folding design that compacts them into a smaller shape for easier transport and storage. 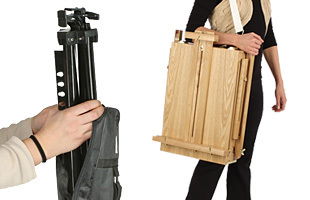 We also offer field easels that include telescoping legs and a storage drawer for painting (or promoting) in any location. 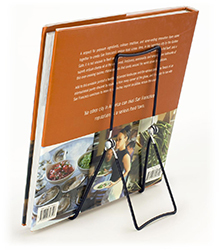 Other menu holder designs like bi-fold frames and A-frames are also available. This catalog of table top and floor standing art mounts includes adjustable models that adapt to users of different heights. This allows both children and adults to use them as painting fixtures. Our inventory of poster holders is ideal for a number of environments and industries, but where are they most often used? Restaurants feature their menu on the sidewalk to bring in customers with these stands. Their prominent appearance makes them great as notice board fixtures for special events. 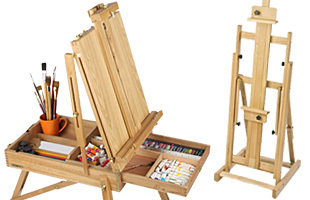 Our sturdy H-frame professional studio easels are excellent for artists that need a large work area. Office workers often present their analysis and ideas using charts with a modern metal or acrylic stand. We also have a large selection of education fixtures, including double sided marker boards for teachers and colorful writing boards for young students. 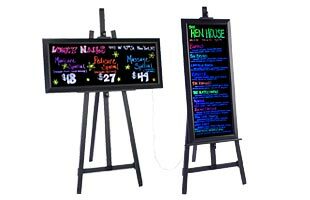 In addition, our LED lit chalkboards and whiteboards are excellent for attracting passersby into your restaurant, bar or service organization. These illuminated boards can also hold promotional graphics, ideal for marketing at trade shows. Browse our massive inventory on Displays2go.com for more wares with same day shipping and wholesale pricing.